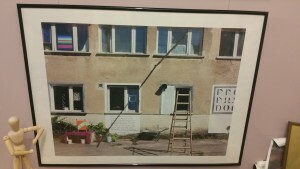 In 2000 German artist Klaus Böllhoff made Prora, Germany his home and art studio. Through a chance meeting with the trackside.contemporary gallery proprietor and curator, David Mackereth, Klaus now exhibits his work there for the second time. This Aylesford gallery has an alternative life as David’s uniquely and beautifully situated riverside and trackside house. 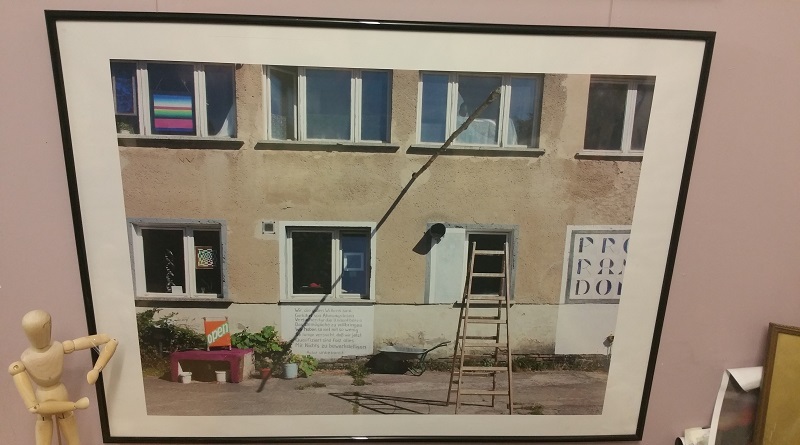 David has given over the majority of his 4 floors to Klaus’ new exhibition, The Last Train from Prora. Aptly titled due to Klaus’ enforced exit. Prora, as I’m sure some of you know but many of you don’t, is on the island of Rügen, Germany. It is known for its excessively large tourist structure, a little like Butlins. However, this is not your usual holiday camp by the sea, it was an ambitious Nazi-planned tourist destination. Built between 1936 and 1939 it was intended to accommodate 20,000 people yet still be potentially convertible into a military hospital… just in case. David found two artists, Mic and Klaus, living inside the abandoned mega-structure when noticing two hand painted signs, Atelier Prorandom and Proradies – they had created an atelier and a gallery intermingled with their living space. These signs were a little glance into the mind of Klaus, his enjoyment of words and his spirituality. 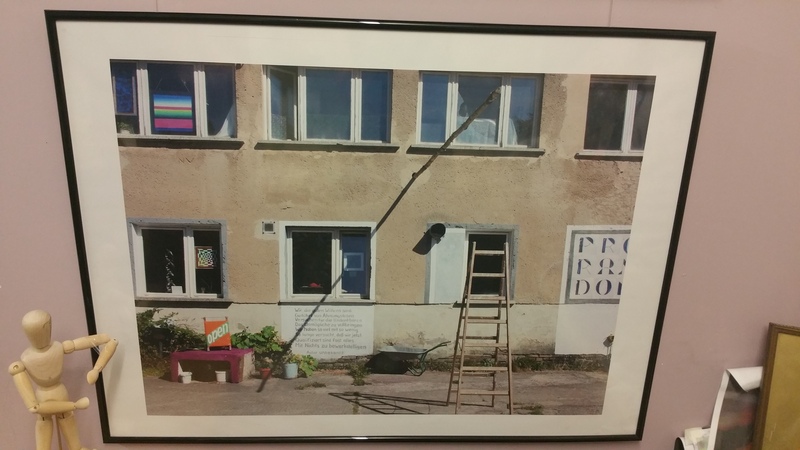 Klaus chose Prorandom because ‘Pro’ was both the link between Prora and his own random discovery which held so much promise. His love of words can be seen in the multiple meanings of his titles. 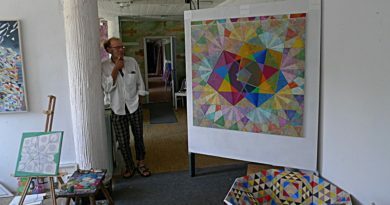 The rest of the floors, alongside some of David’s work and that of a couple of other artists, mainly incorporate Klaus’ work which can be generally categorised into two themes from the last 20 years: his Church Action Paintings and his Geometric Paintings. The former being inspired from an invite, along with 12 other artists, to make art in the church of St Mariengemeinde, Strausland, Rügen. The latter is a geometric exploration. Klaus struggled with the impressive nature of the church until he stumbled upon some discarded lead kame which is used in stained glass windows. 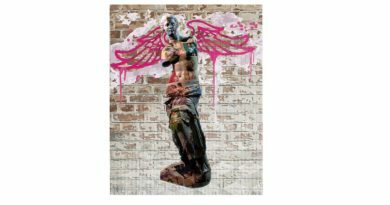 He embarked on producing work which captured the unique feel and light of the church and utilised the lead as a stencil for his controlled paint flicking technique. As a young student Klaus was interested in geometrics and creating the perfect geometric composition based on the numbers 1-9. After a discussion with his art teacher who plainly said it could take him a lifetime, young Klaus felt daunted and put off by his self-imposed task. 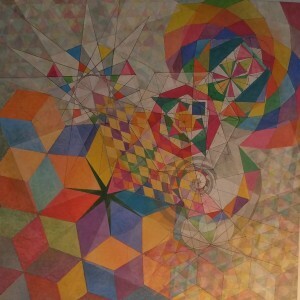 However, later, a more mature yet anxious Klaus embarked on his journey for geometric perfection. An artist can fear a blank canvas just like a writer can fear a blank page and the thought of filling it to achieve a complete work is enough to make anyone sick with anxiety. Klaus decided not to think of the bareness of the canvas but decided to strip it back, right back. He began with a circle. Then found what was required, a triangle which he calls the “mother” or “egg”. “Everything comes from there.” explains Klaus. He uses lines and geometric shapes to build layers. His work makes me consider Mondrian searching for purity. Most people think of artists as freely splashing paint on a canvas or sketching by a river, yet like Mondrian, Klaus is being driven by a search for balance in composition through line and form although, unlike Mondrian, Klaus uses a wider colour palette. They also both use rigid and structured, even mathematical, methods to create. This structure provides a boundary which in turn allows them the freedom to create. Much like nurturing a child, the carer provides a safe boundary and the child feels secure, and therefore free to explore within it. Klaus begins his pieces with a logical construction but next comes the miracle, the flow, as he happily describes. Yet, he can’t explain the concept behind the work. 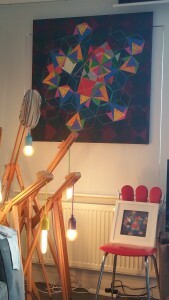 Most of the geometrics are vibrant canvases, full with shapes and colour. The paint is layered and sometimes pastel in shade and muted in tone – his work can feel kaleidoscopic like in Isimplizissmus – random kiss. Zodiak is one of Klaus’ newer pieces. It’s a geometric design of his astrological chart. Like his other work you can see the triangle, the centre of the creation, like the beginning itself; the “mother” the catalyst for all other things. These lines lead to shape and from there he keeps going until he adds colour. Zodiak comprises of bold colours and lines which never quite meet the edge of the canvas and combined with a background of maroon and black tones, it really gives the feeling of being part of the universe. Klaus also has an exhibition planned for October/ November 2015 in London which will be a retrospective of his life. For further information please contact trackside.contemporary@gmail.com and keep your eyes open for the new website which will be available soon. I’ll leave you with a few last words from David, ‘They’ will never take away what Klaus Böllhoff has given to Prora….. He first linked Prora paradise, making the reading PRORADIES …… now it means Prora DIES.’ (trackside.contemporary, May 2015). About the Author: Helen Shewry is a writer and a childcare professional. 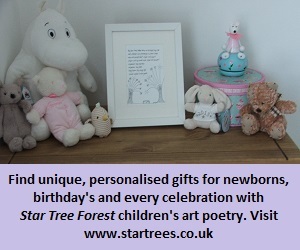 She writes articles on the arts, novels, short stories, flash fiction and has a love of scripts and children’s fiction. With an art history and literature degree tucked firmly under her belt she undertook a creative writing course and regularly participates in writing workshops. Not just a writer, Helen loves to travel and wandered solo through Central and South America in 2011/12 where she found another passion: photography. On her return to the UK Helen was offered a photographic exhibition in London. 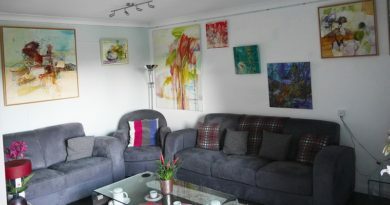 The Home Gallery – Trackside Contemporary, Aylesford.